This isn’t really a review and is mostly just going to be me rambling about what I liked and disliked in no particular order. Keep in mind that there will be spoilers for the plot so if you haven’t beaten the Elite 4/seen any of the Postgame, I wouldn’t recommend reading yet unless you don’t care about spoilers. The newest games are so weird for me because there is a lot of stuff that I really like and a lot of things that are just… really frustrating to me. I think Alola is great and is a really expansive region. It’s nice feeling like I’m exploring so many different things while in the game place. I also like that there aren’t tons of new Pokemon. I know some people are upset that there’s only about 80, but we have over 800 Pokemon at this point. I’d honestly rather see more new regions and/or exploring multiple regions versus more and more new Pokemon. That isn’t to say I don’t like any new Pokemon–I really adore my team in this gen and it was nice to have a starter I liked again as I didn’t care too much for any of the ones in Kalos. That said, while so much was put into the world of Alola, a lot of the buildings kind of were shafted in a way. I was so excited about the hotels for example, but you can’t do anything in them like you could in Kalos. I also feel this game would’ve been perfect for an upgraded version of a Secret Base or even just doing stuff in your room (instead of just permanent boxes being in your house). Not to mention a lot of buildings have doors that essentially look painted on. You can’t enter or interact with them (Not even a “locked” dialogue) and they pretty much look fake compared to a door that you can. The world itself still feels more vibrant with Pokemon cries while walking around and people passing you by (unless you’re talking to someone and then everyone else stops), but there’s just those points in buildings that feel kind of empty. Going onto exclusives, while I’ve always understood Pokemon exclusives (though, am not particularly fond of them), two exclusives in the game are just… incredibly frustrating to me: The time and Colors. There is no reason Moon is 12 hours ahead. There’s no plot thing. It just is. And it constantly throws me off. The day still changes over at midnight. At noon, it is still the same day despite technically being midnight in the game. It’s just… weird and awkward and frustrating. I boot it up in the morning being all “Oh, I can catch this now” except I can’t because it’s night in my game. It’s just… weird. It’s one thing if I set it that way, but it’s just such an unnecessary game function and I haven’t found any enjoyment in it. Similarly, color exclusivity is just… stupid. The customization in this game is such a mix because there are things they do great like all the head accessories and the ability to not choose hats (though, an option to wear both the accessories and hats like in X/Y would’ve been neat), but there are actually not that many things to choose from. Most of it is just adding a lot of colors which kind of gets a bit shafted when there’s 5 colors exclusive to each game. While there is a dye system, it’s much more convoluted than it need to be and I’ll get to it more when I talk about Festival Plaza. I also find it ironic that pink is exclusive to Sun when most girls I know actually got Moon. I was surprised there are no dresses and there’s really only 3 types of tops (Short sleeves, tank, or slightly fancy short sleeves), a few different types of bottoms, and a few different types of shoes. They definitely tried to keep it very Summer-focused, but considering the rain storms and the snowy mountain where the Elite Four is, I would’ve liked to see some “warmer” things too (Quotations are things like tights, short boots, and 3-4 to long sleeves aren’t necessarily all warmer). I also wish there were some choices with the PokeRider outfits if they had to exist. The novelty of those outfits (and the music for the PokeRides…) ran out to me so fast–especially considering nobody else riding around wears them. It’s kind of like my issue with Mario Kart where you have all the characters in their outfits but “Oops safety for you”and suddenly your Mii is in an ugly helmet and poofy suit rather than getting to wear something like the other characters. This is especially ridiculous for Machamp. And even Lapras is pretty silly considering you have probably surfed on one for ages. 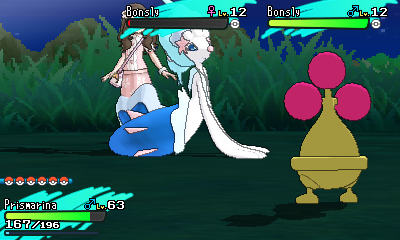 And in X/Y, the attire wasn’t even needed when riding Pokemon. It’s just a bit of a weird choice and I’d rather see my character than wonder how she even fit her hair in the helmet and still have it look that way. SPEAKING OF HAIR…. how is there no ponytail. This is a tropical region. Why can we not use a ponytail?? LILLIE GETS A PONYTAIL SO WHY IS IT THAT THE ONLY NON-SHORT UPSTYLE IS A PAIR OF PIGTAILS THAT IS ONLY AFTER YOU BEAT THE ELITE FOUR. Speaking of which, end-game customization is dumb. Most people want to wear what they like for most of the game–not just the bit of post-game after. 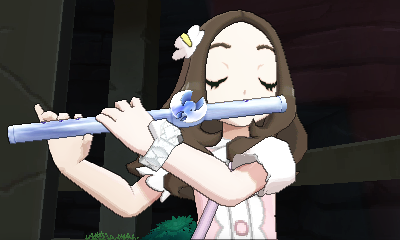 But yes, I would’ve loved to put the hair I’m using in a ponytail :( It’d have been so cute… And I adored my ponytail from X/Y–with the bang options in this game, it would’ve been perfect. It’s just… so disappointing. There’s varied hairstyles, but mostly all down with the few upstyles just very short besides the pigtails. One of the things that is actually killing me this game though is working on my Pokedex which is just… incredibly odd for me. I’ve gotten myself a living dex since I played Pokemon Blue which was my first Pokemon game. I used the Gameboy Printer and printed out my certificates. It was such a big deal to me. This is the first generation where I don’t have the motivation to do it and it’s really baffling to me. Thinking about it, I realized this comes down to two things–the removal of DexNav (which, they brought Pokemon Amie back in some way, I do feel DexNav could’ve returned even better) and just how overly complicated getting Pokemon gets in this game. DexNav was so perfect for people like me who enjoyed catching things before moving on. But this game introduces so many different ways to really change up a Pokemon’s habitat that it just becomes frustrating–especially without that. Some Pokemon will ONLY show up in certain piles of grass on a route. Some will only be available through an SoS call which is one of the most frustrating features in the game and should have stayed exclusive to Totem Pokemon. Nearly every Pokemon being able to do it just makes the Totem Pokemon less interesting. And then making it so some SoS Pokemon will only be in certain weather too? It just isn’t fun. It’s an extra grind and when I find a shiny before I find the evolution of a Pokemon…. That’s just even more ridiculous. Part of me still wants to try and work on my Pokedex, but I just feel so discouraged over it and don’t have the motivation despite spending hours writing up a list of what I need. Something about how it all works in this game is just making me not enjoy it. New elements are fun, but these changes just aren’t. Festival Plaza is where I’ve been spending a lot of time, but I’ve hit a point where I just need so much FP (Festival Points) and the grinding gets tiring. Type Matchups is easily the best Mission to do, especially if lots of others are on, but it’s still something that just gets very repetitive. One of the nice things about Join Avenue was that you could actually purchase things with PokeDollars. I also feel like you were asked and requested for things more often than in the Festival Plaza. I’ve managed to get most of what I wanted already so I have PokeDollars sitting here now with nothing to really do with them. I wish I could exchange them for more Festival Points so I could get some of the higher ranked buildings and buy more things. I mentioned the dye option before so more or less, there’s two ways you can get the exclusive colors–by ordering them from people or by using berries with the highest ranking Dye Shop (5 Stars). Ignoring how silly it is that you can’t have the normal color even if you have that Team’s shop at the highest rank (A 5 Star Team Pink will have Light, Pastel, and Dark Pink, but not the regular Pink), it’s just once again making things more complicated. At the moment, I have two Teams in my plaza–both Red and Pink so I could get the most pink shades. This means I have no Fortune Teller booth because you don’t really have much booth room. Ordering would be more convenient if you could pick what you wanted, but not only do you just need to hope it’s the one item they mention that day, there is no guarantee they will let you order it. 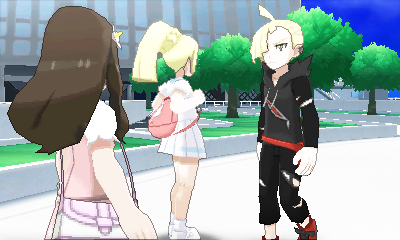 The games are pretty and the cutscenes are lovely and the story is super interesting (even if it got dark at times and I genuinely thought they were going to kill someone) and I want to know so much more about it and the stuff that happened before you moved to Alola (You at least get some backstory on Lillie and Gladion’s Dad which gives some idea of what caused it, but there is still so much I want to know–maybe even find their dad. Heck, going to Kanto to help them would’ve been cool too), but with my favorite aspects of Pokemon games feeling so frustrating, I’m having a hard time to still have fun with it. -Thank god for no HMs. I’d love to see in future games that your own Pokemon could be registered as a PokeRide thing–just a quick button to surf/fly on whoever even if they are in a Box. Especially if Poke Pelago is back by then. -I LOVE TRIALS SO MUCH. I have mixed feelings on the totem battles (due to lag issues and just not a fan of battling), but I love so many different ways to essentially earn a badge. I would love to see more things like this return where you do puzzles and other challenges versus just battling. -The stamp book is adorable.